Brakes are one of the most important systems in your vehicle. The risk of an accident increases dramatically when brakes are not functioning properly. As brakes age, they are gradually worn down, so it’s important to have them checked about every two years, or, when you notice one of these signs that it’s time to fix your brakes. One of the first signs that it’s time to have your brakes replaced is a shrill, squeaking noise. Worn out brake pads are designed to squeak when they’re worn down specifically so that drivers know to replace them. 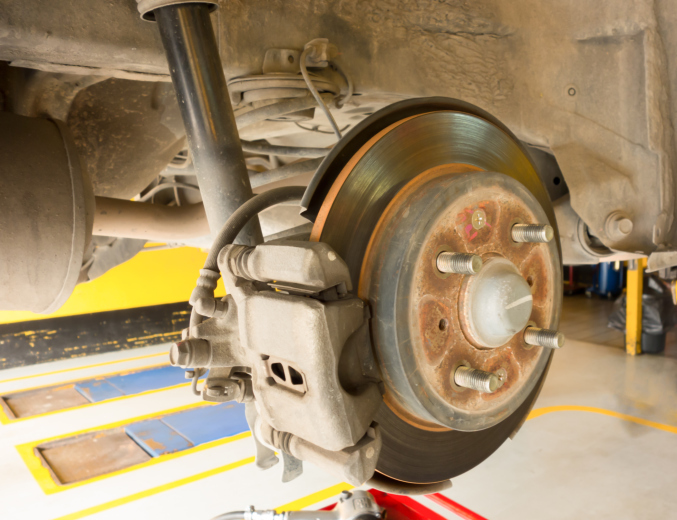 Brakes can also squeal when they’re wet, but the noise should stop when they dry out. If you haven’t used the brakes and they’re wet, pay attention to the noise and if it stops, they may have just been wet. If your vehicle jerks when the brakes are applied, it may feel like the brakes work well, then not as well, as the wheel rotates. This can happen if the rotors or brake pads are warped, and it means that the brakes are not as effective as they should be. If braking causes the car to pull to one side, it could mean that there is a serious issue with the brake system, and the brakes should be serviced as soon as possible. Brakes that sound like they’re grinding have probably been squealing for a while. A grinding noise signals that the brake pad is nearly gone, and should be replaced. Brand new brakes require a little pressure to slow the vehicle, and slightly more to stop it. Brakes that are worn down require a lot of pressure to slow the vehicle, and you may need to apply excessive pressure to get the car to stop. The more pressure you need to apply, the sooner the brakes should be serviced. Brake fluid is an important part of a vehicle’s braking system. If you notice a clear or slightly brownish liquid on the ground under your vehicle, especially near the wheels, your brake fluid could be leaking. It’s important to repair the leak and replace the lost fluid, especially if the fluid is no longer clear and has worn out.